Welcome! Thank you for looking at our condominium! We hope you will come stay with us and share our beach condo on the Gulf of Mexico. At the Edgewater Condominiums, you will enjoy breathtaking views of the Gulf of Mexico and the Bay from our top floor(5th floor), end unit condominium. From the front door/front balcony, enjoy views of the bay and causeway and watch the fireworks and island happenings. From the back balcony (off the open floor plan family room/kitchen), sit back at the patio table with comfy chairs or in the lounge chairs and watch the surf and activities on the beach and at the pool. THE POOL AND HOT TUB WILL BE OUT OF SERVICE APPROX. APRIL 23-MAY 20, 2019 FOR RESURFACING. Our condominium is updated throughout with tile floors, remodeled kitchen and bathrooms and comfortable tropical furniture. 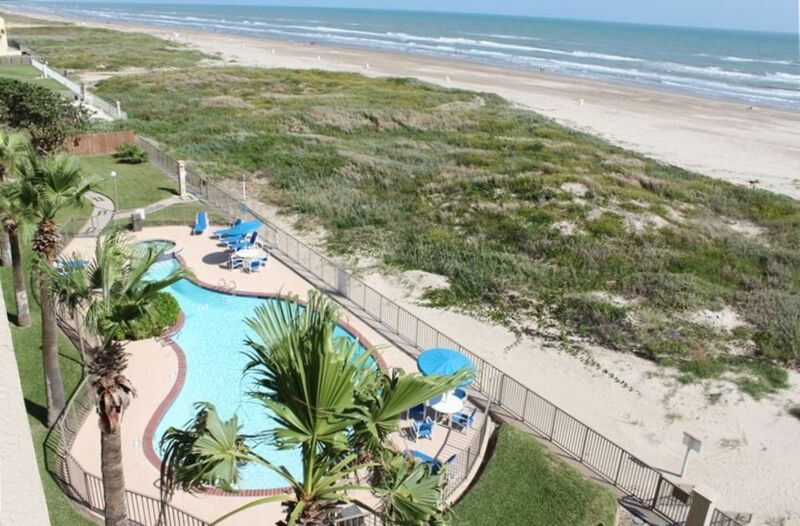 It is centrally located on South Padre Island at the Edgewater Condominiums. Previously we rented it as a 2 bedroom, but have recently opened up the 3rd bedroom. -MASTER BEDROOM- has amazing views of the Gulf from 2 walls of windows as reflected in a picture below. You will also find a king-size bed(with new mattress), ceiling fan, 49" Smart TV and clock radio. The private master bath has a vanity and a separate walk-in shower and toilet. -2ND MASTER BEDROOM-has a king-size bed, ceiling fan, 49" Smart TV. It has a vanity with sink room and a separate room with a tub shower combo and toilet that is shared with the twin bedroom. -FAMILY ROOM-has a sofa with a queen sleeper, 50" Smart HDTV TV with NetFlicks and iHeart Radio, and a stunning view of the pool, hot tub, beach and ocean. -KITCHEN-has solid granite counter tops and is fully equipped for your gourmet needs. There is a coffee pot, toaster, crock pot, can opener, blender, full-size refrigerator with freezer and ice maker, microwave, dishwasher, electric stove and oven. There are several plates, glasses, wine glasses, cocktail glasses and silverware. There are many serving utensils, pots and pans, and baking pans too. -WASHER/DRYER-right off the kitchen in the utility room, where you will also find the iron and ironing board. -LINENS-Sheets, blankets and towels for use inside the condominium are provided. Small quantities of bath soap, dish soap, dishwasher soap and laundry soap also provided. -POOL( heated to 85 degrees year round), there are a few tables and chairs at the pool to enjoy a meal or relax under the umbrellas. Several lounge chairs are also provided for use at the pool. HOT TUB and TENNIS COURT available for use between 9am and 10:30pm. THE POOL AND HOT TUB WILL BE OUT OF SERVICE APRIL 23-MAY 20, 2019 FOR RESURFACING. -GRILLING AREA-No gas or charcoal grills are allowed on individual decks. There is a central grilling area available for your use to the north of the tennis court. -The Edgewater Condominiums is a private gated community. There is a fence around the parking lot that is accessed with a code. The same code is used to enter the gate from the parking lot to the property and to the beach and back. All codes and passes will be provided prior to your arrival. -PASSES-You will receive a parking pass that must be displayed on your vehicle dashboard during your stay. If you visit in the month of July, Spring Break or over Easter week, wrist bands will be supplied and are required for identification on the property. - Please bring your own beach towels, beach toys, chairs and umbrellas to be used at the beach. Or they can be purchased on the island at many novelty shops or WalMart in Port Isabel. -We will ask for your home address and cell number when you book with us and will email you the final Rental Agreement which confirms your stay and details. Towels to be used inside the condominium are provided. Please bring your own beach towels. The living room is equipped with a queen sleeper sofa, love seat, small swivel rocker and a 50' Plasma TV. The dining room table seats 6 comfortably. There is also a bar that has 4 counter height stools. The balcony overlooks the beach and Gulf of Mexico. It is equipped with tables and chairs for dining and comfortable lounge chairs for relaxing. Great condo that met and exceeded our expectations! We loved every minute of our stay, very spacious, well furnished with appliances, furniture, beach items, etc. We spent most of our time on the large balcony enjoying the spectacular view! Jennifer was great to work with on the reservation and throughout our stay, she would respond immediately to questions. Would definitely stay here again! The condo was right on the beach with beautiful views from the top floor. Kitchen had everything needed to cook meals, but we also enjoyed some dinners out. When we arrived, we found a broken coffee carafe. After calling Jennifer a new coffee maker was delivered that afternoon. Beds were very comfortable and condo was spacious and very clean. Excellent condo and location. Thanks! We had a wonderful holiday vacation on South Padre! The condo was very nice and was convenient to restaurants. We cooked in some as well and the kitchen was stocked with most everything we needed. The view of the beach and of the sunsets was great off the front and back decks! Our son loved the heated pool on the cool and windy days. We will be back! Thanks! Excellent Padre Island property and host! My family just returned from Padre Island. It was our first time visiting the island. We had a wonderful time! This condo was great. It was clean, well stocked, was in a great location and had awesome views. The sun rise over the gulf was something truly amazing. We would highly recommend this property. Wish we could have stayed longer! Shout out to Jennifer, our host! Very attentive and super nice! We stayed in the condo in late October 2018 and found it a very nice time to be on the island. It is the "off season", after the summer vacationers and before the snowbirds come down. None of the restaurants or bars were crowded and we were able to get a seat anytime we needed one. The weather was still very pleasant both during the day and in the evenings. The property was as described and was in very clean condition. It is a three bedroom unit with the bedrooms and bathrooms on one side of the floorplan and the living areas and kitchen are on the other side. It has a very nice deck and being an end unit it has the added bonus of the small side deck that opens up the space very nicely. The end unit master bedroom also has the advantage of the larger side windows for a panoramic view of the beach. The kitchen was well stocked with plates, glasses, silverware, and utensils. The tile floors make sweeping up the inevitable sand that comes in on your shoes and makes the unit feel cleaner than carpet would be. The condo would be within walking distance to several of the bayside restaurants and bars. There are several services that will come and do beach set ups for you for the day ( little harder to find at this time of year, but we did find one that operates year round- weather permitting). We were impressed with how well kept the grounds are at the complex. There was someone working everyday that we were there hosing down the walks, maintaining the landscaping, and tending to the pool (heated) and the hot tub. The complex is very secure with a gated parking lot and an additional security gate to enter the grounds. The property owner was very attentive and answered any questions we had and kept in touch with us before, during, and after our stay. We would highly recommend this condo unit to families or couples. -TRANSPORTATION-Our condominium is 30 minutes from Brownsville and 45 minutes Harlingen International Airports. Renting a car is not necessary but many prefer it. There is a free shuttle on the island that comes by the front of the property every 30 minutes(ish). Transportation can also be caught via cab or shuttle to and from both airports. RESTAURANTS: Blackbeards (steak, seafood and sandwiches), Grapevine Café and Coffeehouse(best breakfast burrito's!! ), Yummies Bistro, Sea Ranch Restaurant (fish/seafood), Daddy's (Cajun seafood and pasta), Gabriella’s Italian Grill and Pizzeria, Palm Street Pier Bar and Grill has great nacho's and good entertainment. Padre Island Brewing for a good beer. We always love a lazy day at the beach, watching people walk by, boogie boarding or body surfing which is just a few steps away from the condominium. And the beach is wonderful to just walk. We found Parrot Eyes Restaurant Bar and Water Sports to be a great place to rent kayaks and paddle boards and tour the inlet on the bay side of the island. Schlitterbahn’s Water Park is always fun for everyone. We watch the fireworks, bungie jumpers and ejection chair people from our front deck or we’ll go to Louies Backyard for a closer view. Try shopping in trinket shops or check out Mike Lafferty(singer/comedian) at PadreRitaGrill, the Dolphin Research and Sea Life Center, Sea Turtle Rescue, or South Padre Island Birding and Nature Center are educational and entertaining. There are jet skis for rent, fishing charters and dolphin watching tours close by. And for the more ambitious, kite or wind surfing are very popular on the island. If you take Padre Blvd north, you can drive your vehicle on the beach (be careful though as many people get stuck!) We’ll park on the road and just walk the north beach looking for large shells. We will ask for your home address and cell number upon making your reservation. 90 day rentals are requested for January through April, please. No taxes will be charged on monthly rentals. Prices subject to change without notice until reservation is confirmed.